Filler: Yaris’ car bed | Random moosages as I see fit. If you look carefully, you’ll note that she’s sleeping in two beds. Her car bed is on her normal cot. Someday, I’ll write an actual post again. Until that time, you can take a look Yaris in her car bed. Yaris’ car bed is her favorite bed. 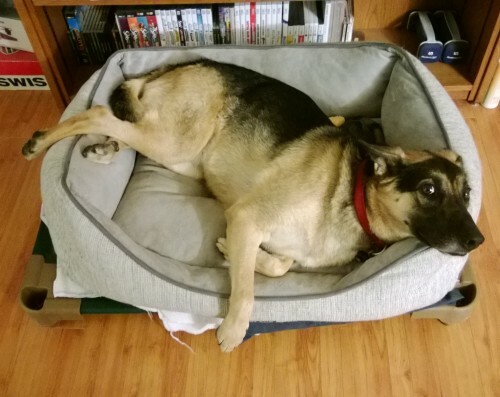 You may be wondering why her car bed looks nothing like a car. That’s because her bed is obviously not in the shape of a car. This is the bed I stuff in my car when I take her for rides. Thus, it is a car bed. She likes this particular bed so much, it’s gotten to the point where she has difficulty making up her mind if she wants to sleep in her car bed, which I’ll leave outside in the living room when I’m working at home, or if she wants to be close to me and sleep in her cot or in her office. So she’ll go over to her car bed and lie down, but then decide she’d rather be closer to me and go into her office or something, but then miss the comforts of her car bed and go back over to her car bed, but then decide she really would rather be closer to me and come back inside to her office or her cot. This repeats until I give in and bring her car bed inside where I’m working and she’ll plop right down and sleep. Anyway, thus is the tale of Yaris and her car bed.